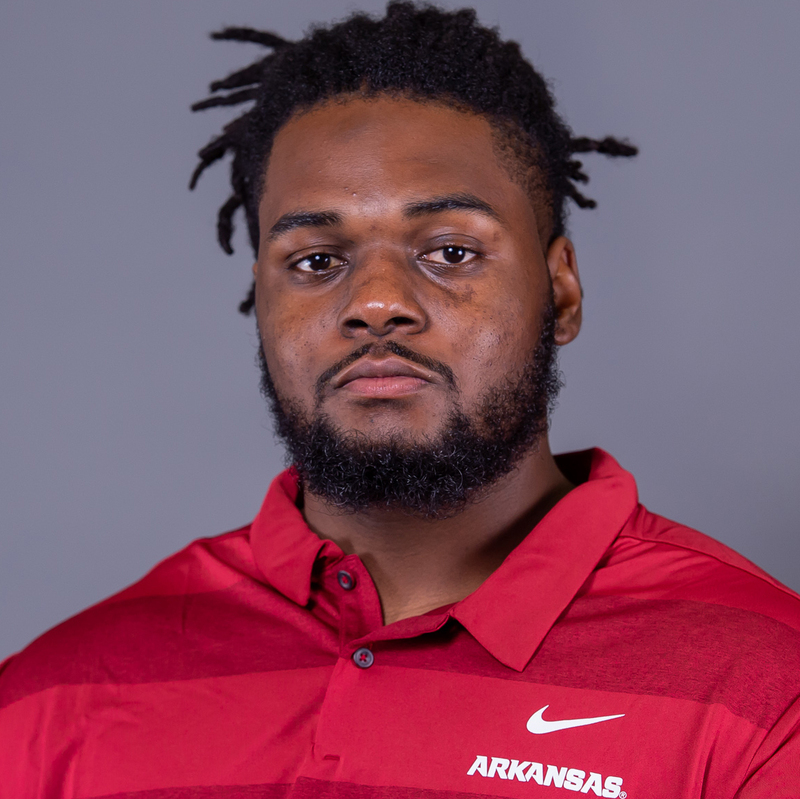 2018 (SENIOR): Played in all 12 games during his final season with the Razorbacks, moving into a starting position on the defensive line for each of the last 11 games of the 2018 schedule … Totaled 621 snaps over the course of his senior year according to Pro Football Focus, with 553 coming on the D-line … Entered the season with just 114 snaps played over the previous three years combined … Recognized three times by PFF, making the National Team of the Week after his week two performance on the road at Colorado State, the Midseason All-SEC Team (89.8 grade) and SEC Team of the Week after week nine vs. Vanderbilt … Earned the Crip Hall Homecoming Performance by a Senior Award from the media after Arkansas’ game against Tulsa … Honored by the Little Rock Touchdown Club with the Dan Hampton Award (defensive lineman of the year) and the Paul Eells Award (perseverance through adversity) … Ranked fifth on the team in total tackles and first among linemen with 49, including 25 solo stops … Posted 8.5 tackles for loss (52 yards), with a team-high 7.0 sacks (50 yards), as both yardage losses also topped Arkansas defenders … Forced three fumbles, a team-best, credited with three quarterback hurries and broke up two passes … Jarred the ball loose from his opponents in each of the first two games against Eastern Illinois and Colorado State, both recovered by the Razorbacks … Also had sacks in each of those first two contests, finishing with two tackles against the Panthers and five vs. the Rams … Made it three-straight games with a sack after recording another against North Texas on Sept. 15 … After a three-tackle performance in the SEC opener at Auburn, matched his season-best five stops against Texas A&M in Arlington, including a sack … Totaled four tackles against Ole Miss in Little Rock (10/13) and against Tulsa (10/20), with a sack and a forced fumble resulting in a turnover vs. the Golden Hurricane … Started a stretch of three consecutive games with a sack, also doing so against Vanderbilt (10/27) and LSU (11/10) … Tallied six tackles vs. the Commodores, then a season-high before capping the season with a best of seven stops, including six solo tackles on the road at Missouri … Recorded the team’s top overall defensive grade by PFF at 85.6, posting eight games with marks over 70.0 … Posted a season-best 92.3 at Colorado State, with a 90.4 pressure grade and an 84.0 mark in run defense in the contest to earn National Team of the Week honors … Earned his highest tackling grade of the year against Vanderbilt, putting together a grade of 76.2 in the category … Wrapped his collegiate career with 667 snaps on defense played and 56 tackles, 49 coming in his senior season. 2017 (JUNIOR): Saw action in five games … Recorded four tackles. 2016 (SOPHOMORE): Made a tackle in his lone game played at Mississippi State (Nov. 19). 2015 (REDSHIRT FRESHMAN): Saw action in 11 games … Made two tackles. 2014 (FRESHMAN): Redshirted as a true freshman. HIGH SCHOOL: A three-star prospect according to ESPN, Rivals, Scout and 247Sports … Received a scouting grade of 85 from 247Sports and a grade of 78 from ESPN … Ranked as the No. 10 prospect from Missouri and the No. 61 defensive tackle in the country by ESPN … Ranked 54th among the nation’s defensive tackles … Helped Christian Brothers High School to a record of 9-3 in 2013, including an undefeated season in district play … Christian Brothers also advanced to the third round of the Class 6A state playoffs as he tallied 66 tackles, including 14.5 for loss with five sacks … As a junior, he recorded 57 tackles, including five for loss with four sacks, and one fumble recovery as the Cadets finished 11-1 and advanced to the quarterfinal round of the state playoffs … Also played basketball and soccer … Coached by Scott Pingel … Chose Arkansas over numerous offers, including Missouri, Kentucky, Cincinnati and Wisconsin. PERSONAL: Born on July 22, 1996 … Son of Dereck Watts and Glenda Williams … Recreation and sport management major … 2014-15 First-Year SEC Academic Honor Roll.